I don’t know about you, but I love to get a little festive this time of year with everyday things – like math practice. So let’s practice counting, counting, patterns, symmetry, addition and more while getting in the Christmas spirit. We’ll use candy canes, reindeer, and make Christmas trees. You’ll love all of these Christmas Math Activities. They’re so much fun and perfect for learning during the holiday season. Whether you’re looking for ideas for your preschoolers or your elementary kids, you’ll find something fun here. I found great counting games, fun geometry games, addition practice and more. 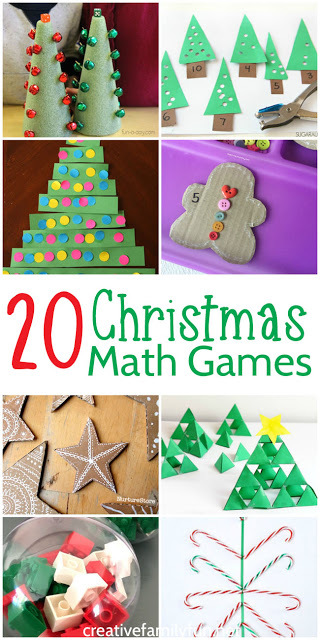 Keep reading for all the fun Christmas math activities. Get a little fine motor practice while using a hole punch to do this simple Christmas Tree counting activity from Sugar Aunts. Practice counting with this Gingerbread Cookies Counting Tray from Teach Me Mommy. Explore patterns with this simple Candy Cane Pattern activity from This Reading Mama (comes with a free printable). Have some sweet counting fun with this simple M&M Christmas tree counting activity from Umbrella Tree Cafe. Practice counting and ordering with this Evergreen Tree Math Game from Mom Inspired Life. Count and have fun with this two-player Jingle Bell Math Game from Fun-A-Day. Do some simple adding and counting while you build a snowman with this fun activity from And Next Comes L.
Use Christmas bows to practice sorting by size with this simple measurement activity from Learning 4 Kids. Practice number matching and counting with this Christmas Tree counting activity (that would make a great busy bag) from Mom Inspired Life. Play with a fun Christmas tree geoboard. Fun-A-Day shows you how to make and use this simple foam tree geoboard. Use candy canes to practice symmetry with this fun activity from Fantastic Fun and Learning. Have you heard of Pascal’s Triangle? Explore this pattern activity with this fun Christmas tree activity from Teach Beside Me. Create a Christmas tree out of Sierpinski fractal triangles with this STEAM activity at What Do We Do All Day. Explore tally marks with this fun Candy Cane math game from JDaniel4’s Mom. Practice your estimation skills with this simple LEGO math activity from Little Bins for Little Hands. Explore tangrams with this fun (and yummy) Christmas Cookie Tangram activity from Left Brain Craft Brain. Learn about fractions with this Snowman Fractions game from Teach Beside Me. Explore a hundred chart and practice simple addition while playing Jingle All the Way to 100 from Simply Kinder. Practice circular measurement, pattern making, and more with this beautiful STEAM Math Stars activity at Nurture Store. Race your reindeer along a number line with this fun and simple Racing Reindeer game from Mom Inspired Life. 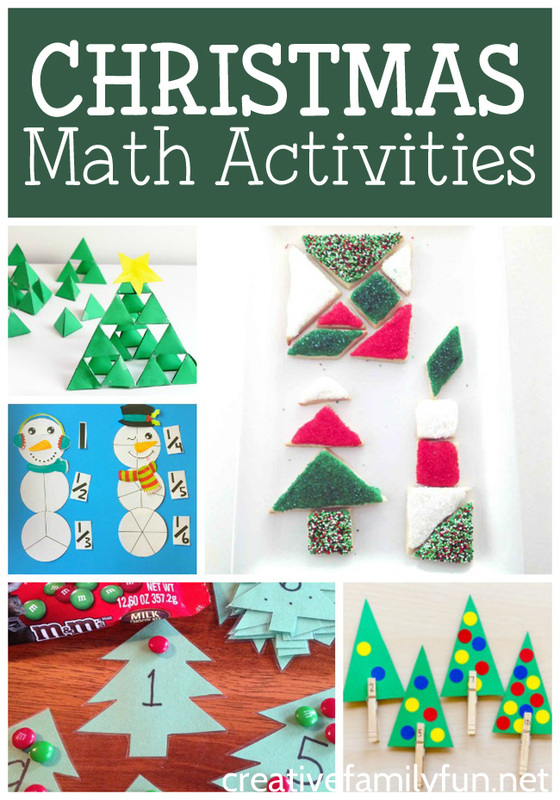 Hope you have a festive and fun time with all these Christmas math activities!